The four faces of the Bengal tiger: "15 April 2009: Displayed for the first time in a specially constructed studio in South Carolina, these images show the four varieties of Bengal tiger. 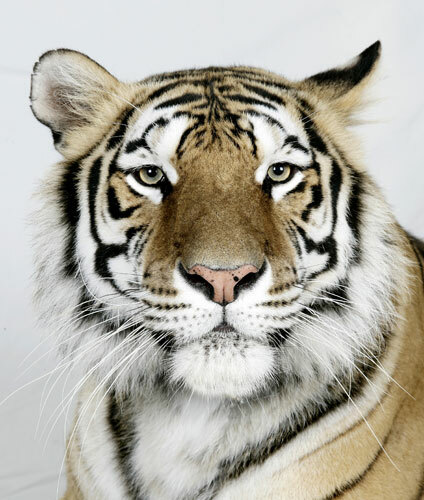 'There are only four distinct types of Bengal tiger in the world and they are all in this amazing photo shoot,' says Dr Bhagavan Antle of The Institute of Greatly Endangered and Rare Species (T.I.G.E.R.S), who brought these majestic animals to the studio. Dr Antle believes the images give away the characteristics of behaviour, age and personality of each tiger. 'Like human photographs, you can see the difference in their age as some of them look a little more grizzled and haggard than others'"